The Myanmar School of Politics (MySoP) is proud to announce the completion of its 14th Core Course, an intensive political training course for politicians in Eastern Shan State, Myanmar. The training was held in Heho, Southern Shan State from 22 March to 7 April, 2019. The core course was attended by 17 state-level senior politicians from 9 political parties registered in Eastern Shan State, along with one official from the Election Sub Commission (Eastern Shan State). The course strengthens the democratic functioning of political parties and promotes multiparty dialogue at the regional and state level. It focusses various elements of political theory and democratic practices as well as multiparty dialogue and cooperation. The course also equips participants with skills such as policy-making, speechwriting, political dialogue, debating, campaigning and gender mainstreaming. A diverse set of classes and activities helped politicians test and improve their skills. At the graduation ceremony on 7 April, speeches were delivered by U Tin Oo, Advocate General of Shan State, Ms. Linda Van Der Horst from Embassy of the Kingdom of the Netherlands in Myanmar, and U Htin Kyaw, Chairman of the Election Sub Commission (Shan State). They wished the graduates well for the future and shared what changes they hoped the course would bring about. On the importance of multiparty dialogue in Myanmar, U Htin Kyaw stated: “Out of all important agendas in this country context, dialogue is one to proceed with. I believe that this training shall introduce the practices of multiparty dialogue, and will grow the culture of multiparty dialogue to be applied in future”. “Regardless of differences in ethnicity, party and institution, we need to collaborate if we are to support the development of our region effectively”, added U Tin Oo. Ms. Linda Van Der Horst encouraged the participants to “seek out innovation and new ideas, have faith, and give spaces to youths and women. Look to the future not the past. Bury old differences and look at what you have in common to create a shared vision of the future, both for Shan State and for Myanmar”. Since 2014, these schools have been held for leadership level politicians from Shan State, Mon State, Kayin State, Kayah State and Tanintharyi Division. H.E. Mrs. Riikka Laatu, Ambassador of the Embassy of Finland in Myanmar, gave the keynote speech during the MySoP opening ceremony on 22 March. Addressing participants, she said “I am very happy to be here and to have the chance to meet with state level politicians from Shan State (East)…I hope that you have positive discussions and learn important lessons for your future”. The whole MySoP team, along with head offices at NIMD and DEMO Finland, wishes the graduates every success in the future. MySoP looks forward to welcoming parties to its 15th core course in July 2019. 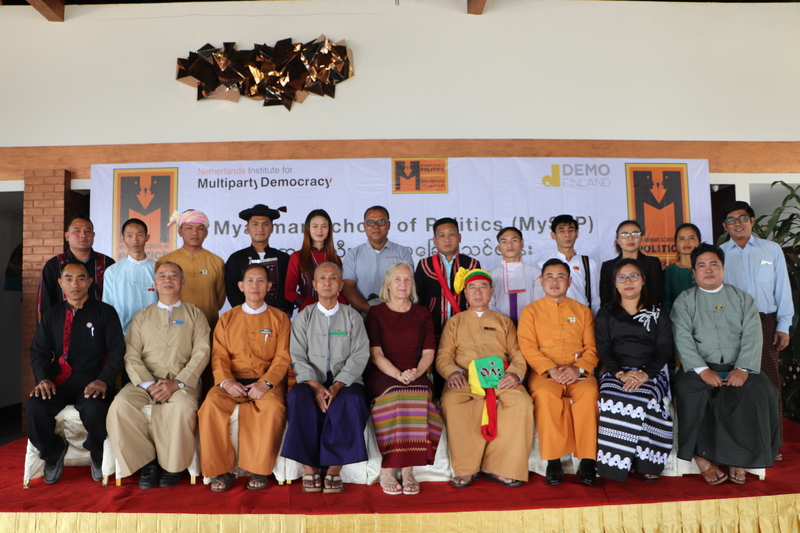 The Myanmar School of Politics (MySoP) is run jointly by the Netherlands Institute for Multiparty Democracy (NIMD) together with Political Parties of Finland for Democracy (Demo Finland). MySoP strengthens the democratic functioning of political parties and promotes multiparty dialogue at the regional and state levels. The 17-day long training programme enhances the political knowledge and capacity of the participants, and supports dialogue among the different political parties based on the principle of multiparty democracy.